Southern forests are rapidly changing as human populations increase and land ownership trends shift. While public lands are but a fraction of the forest land base, they represent the larger parcels, providing unique habitats and recreational opportunities and protecting landscape-scale vistas from development. New and improved tools and technologies are needed to successfully restore and manage ecosystems in this changing environment. Our mission in the Forest Ecosystem Restoration and Management science area is to provide landowners with improved knowledge and technology needed to restore and manage forest ecosystems in the South for a variety of benefits. The focus areas for our multi-disciplinary and integrated research program include: (1)	forest ecosystem response to disturbance, (2)	managing forest ecosystems for multiple benefits in the southern landscape, (3)	maintaining the biodiversity of southern forest ecosystems, (4)	restoring ecosystem structures, processes, and functions, and (5)	forest biomass for bioenergy. Four Research Work Units make up this science area. You will see them listed on this web page. 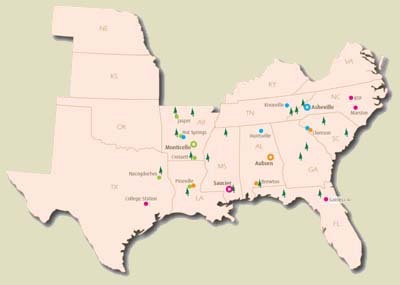 About 30 Southern Research Station scientists are working with our partners in academia, State agencies, forest industry, and nongovernmental organizations to conduct basic and applied studies toward the restoration and management of forest ecosystems in a changing environment. Our research will increase awareness and ability to produce a wide array of economic, ecological, and societal benefits.